I finished Evan Fallenberg's When We Danced on Water nearly a month ago, but I still can't stop thinking about it! (It was seriously that good.) 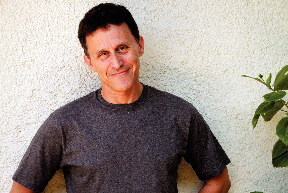 I'm so excited to share my interview with Mr. Fallenberg. Read on -- I hope it piques your interest in his beautiful book. Two early pieces that I wrote and never completed to my satisfaction dealt with the tug between a religious lifestyle and an impossible love. Apparently, I got that out of my system when I finally found the story that suited it, that story eventually became my first novel, Light Fell. I like to write in the wee, dark hours of the morning, when the house is quiet and my brain feels least cluttered and most focused. On occasion, when I’m facing a major revision, I’ll leave home for a few days; my favorite getaway is the guest house at Kibbutz Ein Gedi, near the Dead Sea. I can be blissfully alone there, but when I need a break the kibbutz boasts a sumptuous garden that is an absolute feast for the senses. Was When We Danced on Water the original title of your book? No, the working title for the book was Beautiful Obsession, which sounded to too many people like a bodice ripper. My editor at HarperCollins came up with the eventual title, which is an alteration of a line from the novel. I’m thrilled that the feedback on the title has been positive, but being a rather literal person I still think my original title describes the book most effectively. Maybe I’ll use it one day, if I ever feel the need to write a bodice ripper. As you were writing When We Danced on Water, was there a particular scene or character that surprised you? There were lots of surprises while writing, even though I knew the whole story before I began to write. Most notably, Vivi changed professions (and names) a number of times and Teo changed sexuality. Well, that’s not entirely true: apparently he was always straight, I’d simply misread him. I had assumed (without thinking about it too much) that he was gay, but on a transatlantic flight it suddenly dawned on me that he was straight, and that knowledge brought about a serious rewrite and lots of new insights and plot changes. When I’m not writing I try to look after my body and soul by taking long walks to the beach or doing exercise classes and spending time with family and friends. When you are self-employed and you work in front of a computer I believe you need to build coffee dates and exercise into your daily routine, or you will be a crazy, antisocial, unhealthy, miserable person! My thanks to Mr. Fallenberg for his time. Learn more about him and his work at his website. 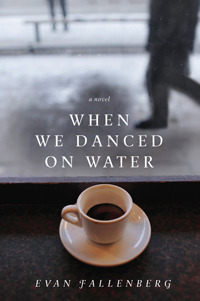 Check out my review of When We Danced on Water and for more reviews, visit the other blogs on the book tour. lovely interview- love to learn about new (to me) authors, am off to check out the review! Great interview! I've been seeing a few reviews of this novel that are really good. I sure wouldn't mind reading it. Sounds like an excellent read, and I loved Evan's revelations while writing! That happens to me, too. Adding to my wishlist! The original title probably would have put me off, as I agree with his editors that it sounds to me like it would be for a romance novel. I would love to be able to see the kibbutz that he describes; sounds quite lovely. I really enjoyed this interview. Evan Fallenberg sounds like an interesting man and I think I'd like Kibbutz Ein Gedi near the Dead Sea. I bet it's beautiful! wonderful interview! I love that tidbit about the character being straight rather than gay. and I too would love to visit that kibbutz. Sounds amazing. Great interview! I just love how characters tell the authors what's what.